Lily stopped me with a nervous and tearful smile and said she needed to talk to me. I knew immediately then what she was about to say, but couldn’t quite believe it. The first thing that went through my mind when she sat my down on the couch and said “I’m pregnant” was fear. “Am I ready? God I can’t even look after myself. Life as we know it will cease.” I think in real terms that thinking only lasted for 4-5 seconds, but it was powerful enough for me to remember it vividly. It was immediately overtaken by a tidal wave of pride and joy that crashed in over the top as we held each other and cried. The day Lily told me she was pregnant I remember so well. At Lily’s suggestion, I’d just been to see a Keneisiologist in St Kilda that morning to try and feel a little bit better in my health – she consulted her tables and told me that at age 37 an incredibly exciting change will come about in my life – she asked me how old I was – I told he I had just turned 37 and she let out an excited gasp. I didn’t really care much for the science belying her prediction, but it felt nice to fantasise that a big good change was possible. One hour later, the biggest and best change of my entire life was to hit me. I arrived home and Lily and I were rushing to get out the door to a 40th birthday lunch down at Red Hill on the Mornington peninsula. We were customarily late and I was getting in my slightly grumpy “let’s get out of here” mode. As we were walking towards the door, Lily stopped me with a nervous and tearful smile and said she needed to talk to me. I knew immediately then what she was about to say, but couldn’t quite believe it. The first thing that went through my mind when she sat my down on the couch and said “I’m pregnant” was fear. “Am I ready? God I can’t even look after myself. Life as we know it will cease.” I think in real terms that thinking only lasted for 4-5 seconds, but it was powerful enough for me to remember it vividly. It was immediately overtaken by a tidal wave of pride and joy that crashed in over the top as we held each other and cried. As we drove to the lunch, a new instinct unlocked in me – one of unquestionable responsibility and protection for my family. I drove far more sensibly than I would have usually for a couple who were now some 45 minutes late for a surprise party. Again I remember this feeling so well. That I would die in a heartbeat for my child and her mother without hesitation or question. I’d never been willing to die for anything – probably at least try and negotiate my way out. It was very hard for any of my initial reaction of fear to survive in the face of this. The fear never really came back in the same way. It couldn’t survive in the face of paternal love. Telling our families was the most exciting news I have ever relayed to anyone. I couldn’t wait for Christmas to arrive so we let them in on our glorious secret. By then we’d be two months – close enough! We sat in the sun with a cup of tea and told them we wanted to give them an early Christmas gift, but that it was unwrapped. Mum shot off her seat to get a bag for the present to go into, which Lily played to our advantage – she simply stepped inside the bag. Dad got it immediately. But it took a while for the penny to drop for Mum – when it sunk in that she was going to be a grandmother, she gasped with wide eyes and excitement abounded. I remember Mum saying “Oh Claytee’s going to be a Dad” which brought me as close back to my original fearfulness as possible. Carlton, you see, is an 8 year old who cries if he get’s left out of games and doesn’t like Marmite. Living up to Mum and Dad’s level of love and care for their children is also fear-inducing. A gold standard that exhausted me thinking about. But again this feeling was fleeting. Telling Lucy’s family the next day was equally delightful. That summer, we took an ultrasound in Christchurch, on New Years’ Eve, just before our wedding party. When I saw our little pea’s heart racing away at 160 bpm, my heart raced with the same pace. 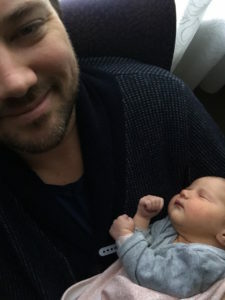 An extra injection of paternal love washed into my system, which was to happen again two months later when we found out we were having a daughter. Over the course of he pregnancy I admired my wife’s courage and tenacity so much. She was in a great deal of discomfort with consistent nausea for the first 4 and a half months, and then increasing weigh and discomfort as our baby grew on her tall slim frame. But she was resilient and didn’t complain. As 40 weeks fell due I packed up my desk at work and put on my out of office ready for baby to come on schedule the following day. Looking back no I laugh at that – a male’s approach to birth giving no bout – “let’s diarise it and get it done”. As the following week passed without anything more than a kick, I realised I may have peaked to soon and went back to work. Next week was the same, but I just didn’t have my head in the day job. I decided to take a few days off anyway to just be present and ready. Those were lovely days, walking in the winter sun, trying everything from acupuncture to spicy food to bring the little stinklet along. Towards the end of the second week we were required to up our visits to the hospital for monitoring from every two days to every day. We were now 42 weeks and counting and time was running out for bambina to make the first move. We had consciously rejected an obstetrician’s recommendation for an induction and the trade off was daily monitoring. Yet her little heartbeat was perfect, the placenta strong and mother well. That was until Friday the 14th of August. This time we were called into the doctor’s office, rather than the usual routine of being let go and told to come back the next day. The doctor told us that the amniotic fluid was falling and we needed to be induced now – in fact she didn’t want us to leave the hospital. Lily burst into deep flow of tears. For her it was a multitude of emotions coming to a head, but the overwhelming one was that her dream of a natural birth of non-intervention was over. I really understood Lucy’s pain – originally I wouldn’t have (although would have respected it), and instead would have applied my Dad’s trademark insurance risk-based lens over the whole process. But Lily had shown me just how meaningful the dream of a natural birth was to her in such a way that I felt upset too when we realised it couldn’t happen. Lily has always been her own woman, and although she relented to the doctor’s advice for an induction, she wasn’t going to stick around waiting in hospital for hours. There was no bed yet ready and we had none of our gear. We struck a deal with the staff that we would go and get our things and come back when a bed was ready – they’d ring us on the mobile. We only lived 25 minutes away. We pottered home and stopped for tea and cake at one of our favourite cafes in Albert Park. It was there that calm and happiness began to restore as we found peace outside the hospital and we could rationalise it all that much better. In fact I think it was there that we became excited again. Once home we called our Doula Erika to allow her to plan her trip in. We also decided we wouldn’t drive back to hospital until we got the call. We’d rather wait for a hospital bed to free up on the couch at home watching tele than in a waiting room. The only thing though was that time was passing. 8pm. 9pm. I rang the hospital to check they hadn’t forgotten us – they hadn’t, but a bed just simply wasn’t ready. Finally around 10:30pm we got the call up and were off. We were so glad we’d had that time to regroup just together at home, and had the courage to ask for that to be allowed. It set the scene for the 24 hours that was to follow and gave us such a calm and steady base for upcoming calamity to spring from. The Labour It was now he middle of the night and to be frank we were a bit tired and bored. Lucy was floating around in a hospital night gown while I slumped in the bedroom seat reading a magazine. Again, Lily had very clear ideas about how the induction should go – she wanted to try as much as possible to bring on the labour with as little intervention as possible which meant breaking the waters first to see if that alone would do the trick. That happened about 3am, and we waited. And waited. I fell asleep actually. Eventually at 10am we had to throw in the towel on that idea. The midwife smiled when we moved to plan B in a gentle way – she’d told us that that was unlikely to do anything but had indulged us anyway. Now came the oxytocin. A drip was applied to Lucy’s arm and she floated around the room as before, but now with a trolley. I set about readying the environment for labour in a way that we had so thoroughly planned. This included illuminating our battery-powered IKEA candles and putting on our “Le Baby is Coming” playlist on the Bose speaker. For that I needed power and found a powerpoint within the cabinet the speaker was sitting on. It took a good ten minutes to jack that up because I tripped and fell whilst head buried in the cabinet and my mouth got stuck around the brass stub dispensing the Nitris Oxide. In panic I took three deep breaths from the self-releasing valve. I tripped and fell in the same way three or four times as I tried to set up that playlist I should add, and would have lodged an incident report with the ward had my eyes been able to focus. The oxytocin wasn’t really doing much for Lily either to be frank and we wondered if the baby would ever come at all. I thought I’d get some lunch so whipped down to the hospital café, not really rushing given the circumstances. When I came back – IT WAS ALL ON. Lily had begun to labour hard. Intense heavy waves that knocked her off her feet and intensified with every pulse. The midwife maintained a constant presence at this point as did her assistant. I was on the phone immediately to Erika to get her on the way. Just after 2:30pm Lily was pronounced to be in “hospital labour” which basically meant the game was on. Lucy began to make sounds now – loud bellowing sounds as the contractions came through. They weren’t panicked or agonising sounds, but deep controlled exhalations of energy. At one point I swear I saw her oesophagus shake at the back of her throat like a Warner Brother’s cartoon character – a long constant siren wail that roused the entire ward from their cups of tea. The main reason why Lily was so vocal is that she had refused any form of painkillers, despite being offered an epidural (and my selfless attempts to test and ready the nitris). It was clear from the body language of the health professionals in the room the Lily’s choice was an atypical one in the face of a fast-paced oxytocin induced labour, but they respected her decision. As the labour intensified, so did Lily’s need for me. I’d emotionally readied myself for the irrational wrath of a dilated wife that I’d read about (“You put this in me!! I’ll kill you!”) but this never came. Rather Lily needed me with her, holding hands with our foreheads together as the contractions came. Our Doula Erika was here by now which gave me so much more reassurance and confidence – I could really focus on giving Lily my undivided attention knowing that Erika was there if we needed any advice about the birth. My admiration for Lily increased as I saw her take full control over her labour, without complaint or panic. Deep yoga-like breaths, calm but forceful instruction to us all, and ownership of the pain. At our wedding seven months earlier I had told her I’d fallen in love with her a number of times as our relationship had advanced – this was the next. The Birth Darkness descended outside and the room fell into candlelight as Lily’s birthplan had absolutely no scope for neons. It was 5pm now and the registrar came in to measure Lily’s dilation. Lily was in the bathroom with Erika at the time and flatly refused the inspection – when the doctor questioned rather curtly “Why not?” she bellowed “BECAUSE I’M ABOUT TO GIVE BIRTH! !” – and she was right. Our darling’s crown was pushing through into the birth canal now and contractions were coming deep, hard and fast. The next 40 minutes went very quickly. I stayed up forehead to forehead with Lily holding her hands while the midwife and her team facilitated the miracle. With our baby’s head now out, we hit a snag and I became very fearful. She wasn’t coming out easily despite her head fully in the world and time was limited until her little lungs would need to start breathing. Lily was trying her best, but was a slave to the rhythm of the contractions. The midwife implored Lily very forcefully to push, but Lily screamed “I can’t!” – nature then kicked in and a fierce final torrent of contraction pushed through Lucy’s body and at 5:51pm our baby was in the world. Lying now on the floor, Lucy held her in her arms – I clambered over drips, cords and chairs to lie on the floor with them too. Breathless and dumbfounded. I couldn’t fathom what I was seeing or feeling. I’d imagined the moment for so long but was completely unprepared for that emotion. She looked like me! Brown hair and narrow eyes, with my ears. Stage two instincts and powers unlocked immediately, and adrenaline released. I wept with my hand over my mouth in awe. Our darling suckled on her mama in her arms. I had no fear whatsoever – just love and unrelenting fearless determination to do anything that was needed at any time. We couldn’t linger though – Lily was called into emergency surgery immediately as the quick and hard labour hard left its mark on her body, and she had lost a lot of blood. As she wheeled off, I took all 3.5 kilograms of Maeve Jeannie Elizabeth Carrick-Leslie in my arms and didn’t stop looking at her until Lily returned to her room. The midwife on duty in the recovery room asked Lily if she was “the one who refused painkillers following an induction”, and it became clear to us that Lucy’s legend had already begun to circulate through the wards. That’s my wife. I felt so pround of both my girls. As I write this exactly 14 months later, I remember every nuance, smell and emotion of the birth with crisp precision. And every day I love my girl more and more. She just took her first steps in the weekend. I should let the Kinesiologist know what happened at age 37 as I’ve never seen her since.